1) The documents in question that have been subjected to scrutiny perhaps never before seen anywhere are copies of the originals. Even the gaggle of experts trotted out by the big media acknowledge that they can't be sure unless and until they see the originals. If said originals are produced and they contain irrefutable evidence of being type-written (impact impressions that go through to the back side of the paper for example), there will be a lot of crow to eat in many corners of blogosphere. 2) Before one gets too excited about the magical things that only computer word processors can do that were impossible in the stone age of typewriters, one should check out this site. Note that the first Selectric Composer was released by IBM in 1966. Then, read the user's guide and note how many of the "impossible" things were actually possible in the mechanical age. As I read it, even the now infamous "superscript th" would be possible to create (see pages 88-89 of the User's Guide) although one wonders why someone would go to the trouble in writing a short memo. NOTE: I am not claiming that the IBM Composer can "kern," because it can't. But it is difficult for my uneducated and unaided eyes me to distinguish between kerning and proportional spacing. Nor do I have anything to add about whether the documents in question adhere to Knuth's algorithim or not; I simply have no way to judge one way or the other. It may very well be that the blogosphere has caught the big media napping (or worse) but that doesn't mean that it doesn't hurt to be careful and meticulous. We haven't had a real, live, authentically-dated video that authenticates bin Laden's existence for well over a year. Why not? Wouldn't it be of extreme importance to his followers that they be reassured that he is still alive? If they can put together a video of al-Zawahri, why not one with OBL? Of course I've been wondering the same thing for some time now. I could very well be wrong but hope I'm not. I watched with interest yesterday as the blogosphere considered the issue of whether the CBS 60 Minutes Bush-was-AWOL documents might be forgeries. As the day went by and more and more observations and bits of information accumulated, it became increasingly clear that the documents are questionable at best (as good a round-up as any of the process can be read here). 24 hours later, the big media picks up the case (see here and here for typical examples). I am still not 100% convinced that there might not be some possible explanation that exonerates CBS because the possibility of a forger using a modern word processor to create a document that was supposedly made via typewriter strikes me as stupid to the extreme. Can anyone really be that stupid? Of course human history shows again and again the answer is yes. Anyway, I saw this early this morning and it made me laugh. Who cares who served in Vietnam...or avoided it? Didn't the election of President Dole, the WWII hero, over Bill Clinton, the draft dodger, settle that as an issue? And frankly, if Kitty Kelly's book claims that back in the 1980s, George W. Bush performed abortions at Camp David while dancing naked on a table, drunk and on cocaine, it won't influence my vote. And frankly, if some veteran steps forward tomorrow proving John Kerry cut himself shaving and tried to leverage that into a Congressional Medal of Honor because he thought it would help him get a date with Jane Fonda and would look good on his campaign resume, it won't influence my vote. Hell, you could tell me that John Kerry and George Bush were once secretly married to each other in a private Skull & Crossbones ceremony at Yale, and I would be too desensitized by this campaign to give a rip. Is anyone actually going to vote this November based on something that happened during the Vietnam war or based on decades-old DUIs or anything other than the economy or the threat of terrorism or a personal conviction related to a specific public policy isisue? No one. Bottom line: George W. Bush has served as president for the past four years. We've all had a front row seat to how he'll likely serve if he's re-elected to the office. Vote against him or for him based on what you, yourself, have observed and based on your personal convictions. Or vote for or against John Kerry based on your perception of his service in the Senate and on what you think of him today or if you are convinced that he'll be a better president. Or vote for someone else if you think neither of them is fit for the office. WHO SAYS THE NEW YORK TIMES EDITORIAL PAGE ISN'T DIVERSE IN ITS OPINIONS? A SILVER LINING IN THE ROK URANIUM CLOUD? Cheong Wook Sik sees one. Accordingly, in order to solve this problem, one needs to find a "clever plan" that would allow both the U.S. and North Korea to save face while minimizing suspicions over North Korea's uranium enrichment activities. This "clever plan" could begin with North Korea arguing -- much along the same lines as South Korea did with its uranium enrichment experiment -- that it attempted to enrich uranium as part of research and development (R&D). If North Korea approaches suspicions surrounding uranium enrichment in the context of R&D, ground would appear for it to claim that since it attempted to acquire uranium enrichment technology as part of its "peaceful nuclear activities," those attempts had nothing to do with the manufacture of nuclear weapons. On the other hand, from the U.S. position, Washington could claim that since North Korea did attempt to possess uranium enrichment technology, U.S. assertions were not incorrect. This solution sounds positively Clintonian (but then again, diplomatic lies are sometimes better than the harsh cold truth of going to war). It also is somewhat analogous to Bruce Cumings' explanation for the DPRK's HEU program: "it isn't a weapons program, it is an energy program. In the end, though, I think there actually is some merit to this suggestion. Since the ROK revelations about its own nuclear programs (Seoul just fessed up to a 20-year old plutonium experiment as well) it becomes harder to criticize North Korea's nuclear activities as a stark black and white issue. But if one emphasizes the ROK's full disclosure and cooperation as an example to P'yongyang, and if all six parties could agree on the face-saving R+D facade, the result might be an agreement that everyone could live with. Here's hoping. If you are at all interested in what 20 bright and engaged George Washington University first-year students are thinking and learning about North Korea, check out their new blog (and wish them luck). THE HOTEL THAT DOESN'T EXIST? Interesting post at The Shape of Days about Py’ôngyang's biggest incomplete construction project: the Ryugyông Hotel. I'm no expert on North Korean psychology, but it seems to me that there's only one plausible answer: Building the Ryugyong was a matter of national pride. The North Korean government put the Ryugyong on city maps before ground was even broken; they even put it on a stamp. 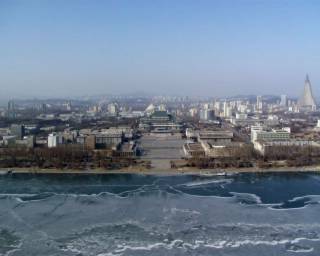 The Ryugyong was to be a monument to the North Korean virtue of juche, or self-reliance. The same sense of pride that drove them to build the Ryugyong has driven the North Koreans to an almost pathological level of denial about the building. It's no longer on the city's maps. Guides claim not to know where it is. No one speaks of it. This state of affairs is made all the more surreal by the fact that the almost incomprehensibly massive Ryugyong is visible from every part of Pyongyang. It hangs over the horizon, never far out of sight. The ultimate expression of the idea of the elephant in the corner. is the title of an intriguing quiz of linguistic knowledge and ability. I started out on a tear but soon got bogged down in trying to distinguish between various Slavic and Balkan scripts. Many argue that McDonalds is the epitome of a global capitalism that erases all regional and cultural differences. I'm not so sure. If the marriage of information technology and business results in a global behemoth like McDonalds being able to cater to the preferences of each individual niche (check out how many different countries one can select on the McDonalds homepage), we might see the intensification of differences (albeit within a globalized world) rather than the eradication of them. If I didn't listen to the North Korean government, they would tie me up, call Dresnok in to beat me. Dresnok really enjoyed it. Even when your head tells you that every country has flaws, even when your head tells you that the United States is no stranger to oppression of its own citizens (try spending a month in a typical American prison), even when your head tells you that demonization of North Korea is probably not the most effective ways of defusing tensions and bringing about peace and stability in Korea, North Korea provides enough stories and quotes like these to make your heart sick. Unification Minister Chung Dong-young said yesterday that abolition of the National Security Law is the government's policy, deepening the political and public conflict over the fate of the controversial draconian measure. "Our government's position is to repeal the security law. The thing left is for the National Assembly to discuss and decide the matter," Chung said at a meeting with reporters. The remarks of the minister responsible for inter-Korean relations followed hard on the heels of a call by President Roh Moo-hyun for the anti-communist law to be repealed. I happen to agree that South Korea would be a better place without the National Security Law. But this article reveals, once again, my abysmal ignorance: is the wording of the National Security Law explicitly (and solely) anti-communist in nature? My understanding always was that although the law was used by ROK dictators to suppress dissent in the name of anti-communism the wording was in terms of threats to national security, not anti-communist national security threats. Anyone out there know better? The Marmot stirs up a hornets' nest by wondering whether Honest Abe would be hauled before the Hague as a war criminal if he lived today. Nothing like taking on long-cherished shibboleths to shake things up! Recent history confirms that North Korea shrewdly uses the lure of openness and riches to extract as much profit and as many diplomatic concessions as it can, but it has never tolerated more than a very limited amount of free trade, which it hermetically seals off from the rest of the country. If we can see that economic penetration leads to ideological penetration, presumably, so can the North Korean security services. Kim Jong-Il must realize that if his people really knew how the folks live down South, his movie would end with a backdrop of torches and pitchforks. For that reason, no government has ever taken greater care to limit contact between its citizens and foreigners. These are, I believe, good points. At the same time, I think it is important to point out that things do appear to be changing (at least at the margins) in North Korea in ways that some in the leadership do not wish to see (and even deny the existence of). Samsung Group, Korea's top conglomerate, said yesterday it will increase hiring 20.2 percent this year, raising hopes that other companies will follow suit and ease the country's lengthy job drought. A sign that the ROK's most successful chaebol continues to do well? Probably. Korea's job market has remained in the doldrums as local companies have scaled back their investment plans amid lingering economic uncertainties at home and abroad. The nation's booming exports have also failed to translate to brisk hiring, which is considered the key to increasing household income and reviving domestic demand. State data showed that Korea's seasonally adjusted unemployment rate rose to 3.6 percent in July from 3.5 percent in June. 3.6 percent = "the doldrums"? The Bush Administration would kill for a 3.6% unemployment rate! The accompanying booklet "tells Queen fans that Bohemian Rhapsody is about a young man who has accidentally killed someone and, like Faust, sold his soul to the devil. On the night before his execution he calls God in Arabic, "Bismillah", and so regains his soul from Satan." On the other hand, I didn't realize that Freddie Mercury was born Farrokh Bulsara either. How good are you at distinguishing between prescription drugs and Transformers(tm)? Take the test here (if you're like me, it will be harder than it looks). Thanks to Learning to Fly for the link. can be found at Ed Fitzgerald's unfutz blog here. Hours of entertainment for fans of statistics, projections, and other arcane forms of prognostication. Thanks to Cut on the Bias for the link.